There is Beijing’s United Nations Security Council membership, the CPEC, and the host of support Islamabad has received over the years. New Delhi: China’s Muslim Uyghur population is said to be languishing in “re-education camps” in the country’s Xinjiang province, where they are stripped of their rights to practise Islam and forced to assimilate into the Chinese Communist culture. Right next door is Pakistan, the world’s first avowedly Islamic state, which should have been at the forefront of protests against the crackdown, just as it routinely threatens to internationalise the situation in Muslim-majority Jammu & Kashmir. Only last week, as a Dutch Right-wing lawmaker planned to organise a cartoon contest over the Prophet Mohammed, #OurProphetOurHonour trended on Twitter, and thousands of hardline Islamists sought to convince the newly installed Imran Khan government to cancel diplomatic relations with the Netherlands. In the end, the Dutch politician cancelled the contest, but the question remained: Why doesn’t Pakistan invoke its “all-weather relationship” with China (“higher than the mountains, deeper than the seas and sweeter than honey” is the slogan leaders from both sides recite whenever they meet one another) to publicly castigate Beijing for its persecution of the million-strong Uyghur Muslim minority in Xinjiang province? 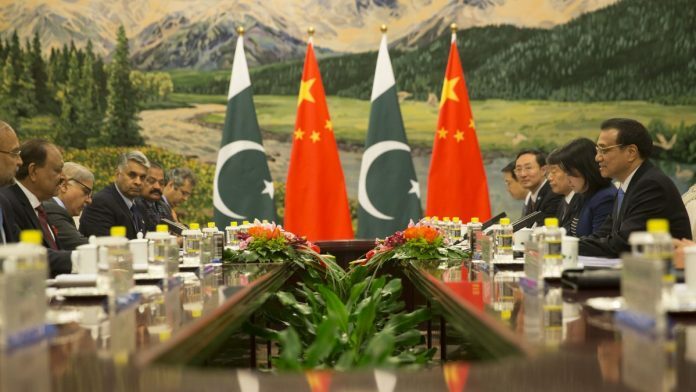 “There is a China-Pakistan strategic nexus, a kind of stranglehold China has over Pakistan,” Ashok Kantha, former ambassador to China and director of the Institute of Chinese Studies, told ThePrint. “Apart from the assistance for its nuclear and missile programme, Pakistan’s willingness to offer itself as a component of China’s larger strategic ambitions through the China-Pakistan Economic Corridor (CPEC) flagship initiative, means that Pakistan looks upon China as a special ally,” he added. Kantha pointed out that Pakistan would not want to “undermine this privileged relationship” by commenting on what is happening in Xinjiang. Interestingly, he added, the silence on China was true not only for Pakistan’s official establishment, but also society as a whole. “Apart from the fact that this special relationship affects India, what is also new is that China is invested in the economic development of Pakistan in a manner that ensures the political stability of Pakistan,” Kantha added. With the CPEC now being built at a cost of $62 billion from the Karakoram mountains in the north — just over the border from Xinjiang — to the Gwadar port on the Arabian Sea, the China-Pakistan client relationship seems to be complete. “Pakistan is indebted to China for all manner of reasons. But none more than CPEC, which is treated by Pakistan like the goose that lays the golden egg,” China expert Jabin T Jacob, who works with the China Report magazine, told ThePrint. Certainly, Pakistan relies upon China’s veto at the United Nations Security Council to bail it out of every uncomfortable spot. Beijing, since 2016, has refused to allow a UN ban on Masood Azhar, the Jaish-e-Muhammad terrorist who has lived in Pakistan since his release after the hijacking of IC-814 in December 1999. In return, Pakistan routinely targets, eliminates or hands over East Turkestan Islamic Movement (ETIM) militants to China. Pakistan believes it is its Islamic duty to flag the persecution of Muslims anywhere in the world – the Rohingya in Myanmar, in Chechnya by the Russians, Bosnian Muslims rebelling against Serbs – except in China. Similarly, Beijing remains unfazed by occasional criticism from UN bodies like the Committee on the Elimination of Racial Discrimination (CERD), powerful pro-US organisations like the World Uyghur Congress, as well as bleeding-heart NGOs all over the world. The silence against the persecuted Uyghurs becomes oppressive as you travel across the Arab world. From Saudi Arabia to the UAE to Egypt in the Maghreb, not one country speaks up. This silence is wound up in the geostrategic games nations play. Xinjiang is at the heart of Chinese President Xi Jinping’s pet project, the Belt and Road Initiative (BRI). As it is the main port for all of China’s interactions with Europe, the Chinese are doing everything in their capacity to keep it calm and quiescent. A massive propaganda exercise is underway to demonstrate that the Silk Road Economic Belt, BRI’s most visible leg that passes through Xinjiang to and from Europe, is a peaceful and stable route. “China’s permanent seat on the UN Security Council, its economic weight and its extremely nimble diplomacy combine to keep the Uyghur issue off the radar in most countries,” Jacob said. Yu Zheng Sheng, the Number 4 man in the Chinese Politburo in charge of Tibet and Xinjiang, Jacob pointed out, had visited Pakistan on the eve of the 19th Party Congress earlier this year to talk to Islamabad about the restive Tibetans and Uyghurs, respectively. Srikanth Kondapalli, professor of international affairs at Jawaharlal Nehru University, pointed out that Islamic nations’ silence on China’s not-small Muslim population was also because “the narrative surrounding the Uyghurs itself follows a double-trap approach”. “For the West, they are projected by the Chinese as terrorists trying to split the country,” Kondapalli said. “The Muslim world sees them as pork-eating, alcohol-drinking liberal Muslims who do not integrate well with the behavioural norms of their own conservative nations,” he added. Certainly, the Uyghurs have a problem. Because they have been part of Communist China for nearly 70 years, they have been forced to participate in the Communist Party’s atheist diktat. This means that all overt allegiance to any religion is banned, and any religious practice, if at all, must be subject to the party’s control. Although, in recent years, some relaxation has taken place, and mosques, like Buddhist temples and churches, are beginning to be allowed. Since the Chinese Communist Party, in 1949, took a leaf out of the doctrine prescribed by the former Soviet state, disavowal of religion especially meant a ban on all ritual relating to food, drink and personal habit. Like Muslims in the former Soviet Union (who, for example, were forced to even Russify their names, with Mohammed becoming Mahomedov), Chinese Muslims were also forced to abandon their distaste for pork and alchohol – this was anathema to the rich, but conservative, Arab world. Saudi Arabia led the campaign for the re-Islamisation of the five Muslim-majority Central Asian republics when the Soviet Union disintegrated in 1991. But China, which learnt well the lessons from that disintegration, instead ramped up its economic strength while consolidating its territorial unity and integrity. The control and consolidation of the Uyghur, Hui, Manchu, Zhuang, Tibetan, Mongol, Manchu and several others of the 55 minority groups recognised by the Chinese Communist Party, led by Deng Xiaoping at the time, was well underway. So, when the CERD recently released a report saying it was “deeply concerned” about the detainment of Uyghurs, both China and the rest of the world ignored it. Just like it does findings of rampant torture in detention and “re-education camps” in Xinjiang by the Uyghur Human Rights Project (UHRP), based in Washington DC and funded by the US National Endowment of Democracy – Uyghurs were forced to eat pork, and “compelled to make pledges to consume alcohol, smoke tobacco, and tell other Uyghurs about the evils of Islam”. China itself has made no bones about its priority, which is to keep the territory of the People’s Republic together. Beijing fears the Western world is using the instrument of human rights to weaken it. So, despite calls from the Dalai Lama for reconciliation and to follow the middle path, the Chinese deride him and call him “splittist”. Despite large bilateral trade with Taiwan, Beijing threatens other nations with varying degrees of isolation for ties with Taipei. At least two decades ago, the Chinese launched a war against the “three evils”, extremism, terrorism and separatism. When the Tibetans or the Uyghurs occasionally revolted, Beijing never hesitated in implementing its “strike hard” policy. That is, any rebellion would be dealt with a heavy hand, including death. The unequivocal message was that the Chinese state simply could not be challenged. Ryan Barry, spokesperson for the World Uyghur Congress, told ThePrint that the US, before the 9/11 attacks, refrained from describing the Uyghurs as “terrorists”, like the Chinese did. Things changed afterwards. “In need of global partners in its own fight against terrorism at the time, the US accepted the Chinese narrative (on the Uyghurs), despite the fact it was not grounded in reality,” Barry said. In 2009, in one of the worst bouts of violence in which close to 200 people were killed, the Uyghurs were systematically raided and targeted by Chinese authorities in a “strike hard” campaign. As Xi Jinping’s BRI becomes China’s pet project today, Barry added, there is a “dramatic escalation in China’s persecution of the Uyghurs. It seeks to establish complete control”. One of the reasons for the striking silence of the Muslim nations is that it is itself split down the middle. The Sunni Arab nations, led by Saudi Arabia and the UAE, have very bad relations with the leader of the Shia universe, Iran, which is happy to get even closer to its largest oil client, China, even as it is subject to serious sanctions by the Western world. As for Indonesia, the nation with the largest Islamic population in the world, it is a neighbour of China and constantly grappling with other issues of sovereignty as well as trade with Beijing. But Kondapalli, the JNU professor, also pointed towards China’s nimble diplomacy on the Uyghur issue, by treating its Muslim minorities differently. “For example, the Chinese are happy to doubly marginalise the Uyghur in comparison with the Hui group of Muslims, which eat pork,” he said. “Unlike the Uyghur, which don’t, the Hui Muslims are seen to be more moderate,” Kondapalli added. Still, as the Chinese transition to a wealthy nation and challenge America’s status as the most powerful nation, the Uyghurs will likely become another casualty in the games nations play. As global confrontations sharpen and the Arab world, like everybody else, looks to protect its economic interests, it is unlikely to risk offending Beijing. For the moment at least, the Uyghurs will have to learn to live on their own. I agree Muslim nation are , cannot and very likely will not do anything. Will the emerging Indian empire call for rights of Uighirs as it pursues to be the next police of the word , asking for a permanent seat at UN Security Council.